In 2016, the market in Calgary was terrible. The recession was affecting many industries and as a result, many people. Given I am a self employed event planner, I realized that many events I had worked on in previous years were being cancelled or handled in-house. There had also been some transition in my life both professionally and personally. 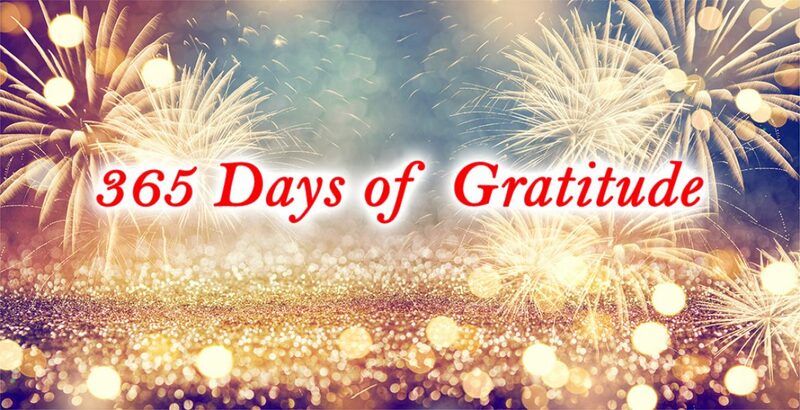 Around April 2016, for no real reason other than I knew I wanted to concentrate on the good aspects in my life (such as the silver linings) and shift my perspective, I embarked on a 100-day challenge of daily gratitude. At first it felt like an impossible endeavour but I quickly found that each day I could find at least one thing to be grateful for. As each day passed, I was surprised how when I concentrated on what I was grateful for more and more, things started to show up in my life that continued to expand my journey of gratitude. Which brings me to the decision to practice 365 days of gratitude in 2017. One hundred Days of Gratitude passed before I knew it, and I had had so many amazing and unexpected experiences during that time that I was intrigued to see what an entire year of gratitude might bring! So, I decided that I would make myself accountable by posting each day on Instagram. What I love about Instagram is that I have a photo diary of every day of 2017! I have a smaller but active community on Instgram and having the ease of entering this information on an app on my phone meant that I never had an excuse for missing a day. In this case it really is about the journey and not the destination. When I started 2017, I wrote in a journal a few things that I wanted to be intentional about in the year. For me it was about finding joy in the little things. Being present. Being courageous. Pushing myself outside of my comfort zone and trying new things! In 2017, I produced my first two-day conference for over 700 attendees with a tradeshow component. In 14 years of event planning, I have had the opportunity to create many events and this one was no exception. This conference was in its 15th year and I was stepping into some very big shoes. While I won’t go into many details, with the recovering economy – there was a lot of fear about the overall attendance and success of the event. My team did an entire rebrand for our client and we brought our numerous years of tradeshow marketing experience. As a result, this client saw their most successful year since the recession began. To say that I had pushed myself out of my comfort zone would be an understatement. Truthfully I never doubted that we would give this client everything we promised and more. When practicing daily gratitude you have days where you lead a very average life. As a single mom, my days are filled with work and my evenings with my son – doing things like guitar lessons and running to karate, getting groceries and doing laundry. But even in the day to day I found so many things to be grateful for. Winter tires in snow storms, Bailey’s in my coffee and nights when my parents made dinner because I didn’t have time. Even when a stranger offers to help with large packages at Ikea – that I couldn’t possibly have gotten in the car myself. The intention of finding joy in the day to day really does pay off. What’s better than holiday and times when we get to spend time with people we love and cherish? Some how through this year I had some pretty awesome invitations to spend time with people I adore. The truth is we could be doing nothing more than drinking a coffee (who am I kidding – wine, we would be drinking wine together) and yet at the same time we were creating memories during events, concerts and even on trips together. The intention of being present make life a gift. Speaking of travel, at the beginning of the year I committed to myself that I would check two bucket list items off my list in 2017 – a Trip to Kauai and a trip to Great Britain. Anyone who knows me, knows I love to travel. I have been fortunate enough to collect many stamps in my passport. These two trips fall into the intention of being courageous. I booked Kauai for my son and me, and having never been to the island before, this was quite an adventure. Anyone who travels with kids knows it’s not for the faint of heart – when there are two parents going that’s one thing but when you’re alone with a very spirited seven year old, that’s another experience! I’m so very grateful for that trip! We had an amazing time and we created so many terrific memories together! I also did a tour with my mother this summer and can’t express how grateful I was for the time away with her. I had initially convinced myself (being courageous) that I could travel alone. And I would have. But my mother saw this as an opportunity for us to have some time together and as we get older I’m constantly astounded at what a great human she is. We celebrated my 43 birthday in Bristol and I couldn’t think of any better way to spend it than with the person who brought me into this world and raised me as a single mother herself. While I had so many good days to be grateful for. The year was not without a few bads days too. Like when the water line to my fridge had an undetected leak in it that caused tens of thousands of dollars of damage to multiple floors in my home. When looking at gratitude – I was so grateful to have insurance. I was also fortunate to have a quick acting team that came to the house and helped me in what might have been the worst day of my entire year. I was committed to making these posts daily for a year and as I shared through the good days and not so good days, one thing that has stuck with me was the people in my life who came forward to tell me that they looked forward to reading my gratitude posts. In some cases, they found it inspiring and in others it reminded them that we can find good everywhere. They also started looking for things to be grateful for. It occurred to me that I was selfishly doing this for myself; however, in sharing it with others, they were affected too! One year seemed a bit daunting at first but I can say with all honesty that it was the best year of my life to date. The best part is that in being grateful daily – is it has become second nature. I continue to practice through sharing with others and in my journal, 365 days is completely possible – you just need to start with one day and build upon that. Now I’d like to leave you with this post that demonstrates how I have chosen to live in recent years – you get out of life what you put into it. Maybe consider adding a little gratitude to your day and see what a difference it makes in your life too!